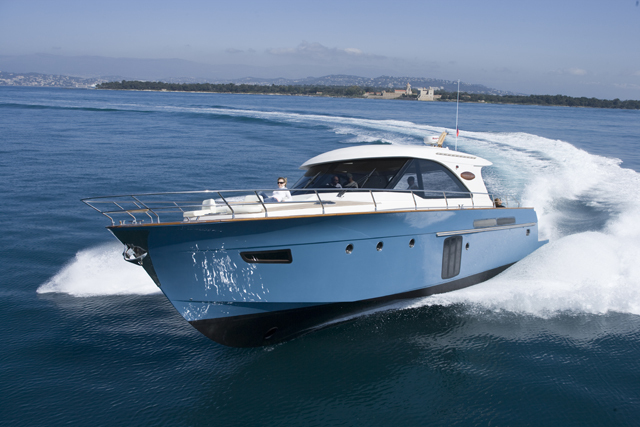 Alex Smith reviews the new flybridge cruiser from reinvigorated Italian marque, Sessa Yachts. 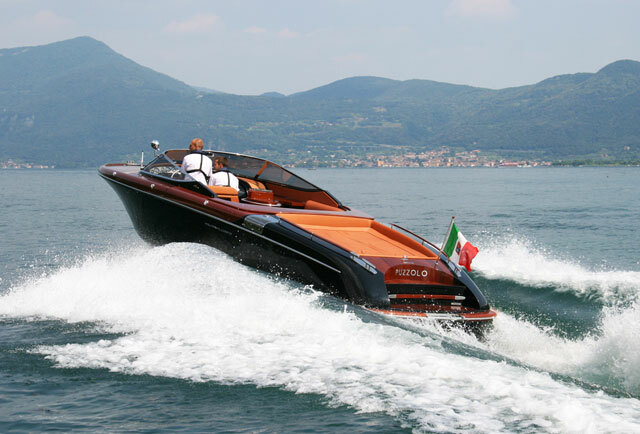 Sessa’s new F42 is an indisputably fine looking motoryacht. In fact, when you consider the lofty, cumbersome shapes so often seen in the compact flybridge sector, its appeal is even more striking. Although it’s the smallest of Sessa’s three Fly models and appears to use a stylistic template derived largely from the 47, its low-profile cross-section, golden hull-sides and Italianate fusion of traditional portholes and angular, wedge-shaped windows, lend it an aesthetic loveliness few flybridge yachts at this length can match. However, it’s not until you step into the saloon that the real direction of Christian Grande’s latest design makes itself plain. 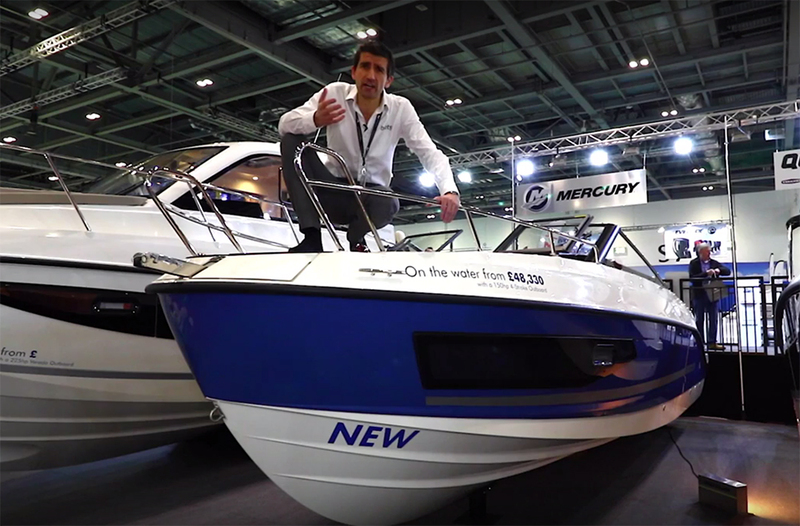 Check out the First Look Video recorded at the Dusseldorf Boat Show, then read on for the rest of my review. It is immediately clear that the main deck is much more complex than the standard open-plan, one-level space that has become so popular among motoryacht designers. While the lounge, with its starboard L-shaped seating section, is essentially a continuation of the aft cockpit, the rest of the internal space appears to inhabit differing levels. To starboard, the helm is a substantial step up and to port, directly across from the helm, the sunken galley is an even more substantial step down. In fact, it essentially inhabits the lower deck - but such is the bulkhead-free openness of this section that it forms a wide-open atrium, bringing the lower and main decks into seamless union. It also allows natural light to flow unchecked and it keeps the cooking space very fresh, open and comfortable with an attractive degree of saloon integration. The galley-down, helm-up arrangement is more attractive than it is practical. Ironically, however, this excellent galley is also the source of the Sessa’s most profound compromises - and the reason for that is very simple. While most people are required to decide whether to inflict the cooking station on the lower deck (minimising night-time accommodation) or on the main deck (minimising day-time lounge space), the F42’s galley straddles the two decks at once, wasting a lot of vertical volume and swallowing up a sizeable portion of both regions. 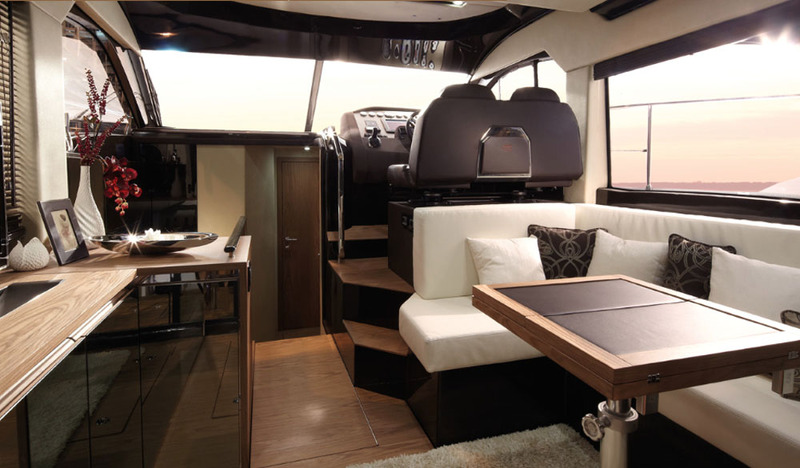 When you also consider that there is an exterior galley with fridge and grill, positioned between the aft cockpit and the swim platform, it’s fair to say that (in contrast to most motoryachts in this sector), cooking feels very much like the central consideration for a great many of the design decisions regarding the main deck layout. The arrangement on this new Sessa also means that the helmsman is a bit cut off from the rest of the passengers. In order to generate extra space for the guest twin to starboard, the helm is elevated, above and ahead of the lounge seating. In the absence of conventional companion seating to port, this means that the Skipper gets nobody to keep him company except the occupant of the second helm seat; and nothing to look at except the sunken galley to his left and the horizon ahead. The main deck is all about the galleys. Down below, the open galley also means that in place of the three cabins you might usually expect on a motor cruiser of this length, there are just two: the main in the V of the bow and a guest twin to starboard beneath the helm and main deck lounge seating. However, despite the limited sleeping capacity, it has to be said that both do a very sound job. With generous headroom of 1.9 metres, plenty of storage beneath the elevated bed and very attractive ensuite facilities, the owner’s cabin offers useful scale, both in terms of its footprint and its vertical height. The smaller guest twin can also be configured as a double and, like the main cabin, it comes with its own toilet and shower facilities. Notwithstanding the complexities of the spatial arrangements down below, the well-proportioned flybridge is a refreshingly uncompromising platform, which uses every conceivable inch of space, right from the aft end of the lower screen to the forward edge of the transom. On this particular boat, the fly is rigged with continuous bench seating around the deck’s entire periphery, apparently in response to the demands of the Chinese market. I can’t begin to imagine what form of recreation might require such a layout but if you need something more versatile, it’s good to know that the more commonplace wet bar and dinette can also be specified, breaking the deck into two more distinct sections and generating much better value from the available dimensions. 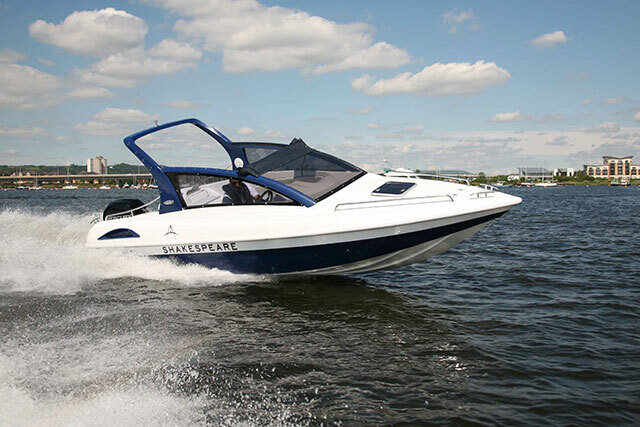 The large, lightweight fly is a huge bonus on a boat with such raked and dynamic looks. Either way, the fact that Sessa has used carbon fibre in the construction of various parts of this flybridge shows a very welcome respect for the finer details. We haven’t yet tried this boat in the water, but by helping avoid undue elevation of the centre of gravity, it means the F42 is unlikely to suffer the ‘pitch and wallow’ issues that so often afflict the seakeeping characteristics of cruisers with oversized fly decks. 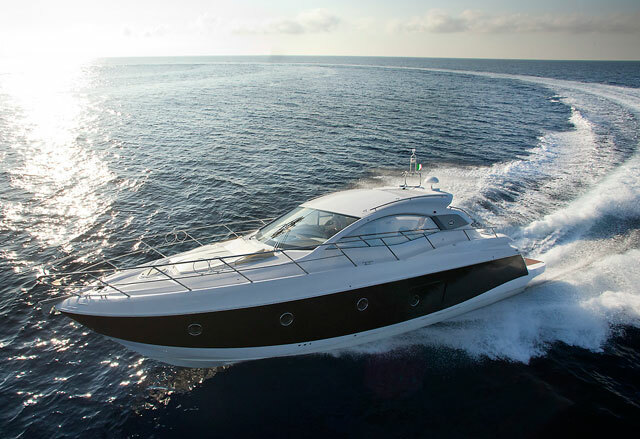 The F42 is a very attractive flybridge motoryacht with some bold layout design choices that may or may not suit your needs. The provision of a wide-open ‘inter-deck’ galley is by no means the most efficient use of the available space - but if you prioritise good looks, natural light, dynamic performance and a generous fly over three cabins and a communal helm, there is plenty here to like. 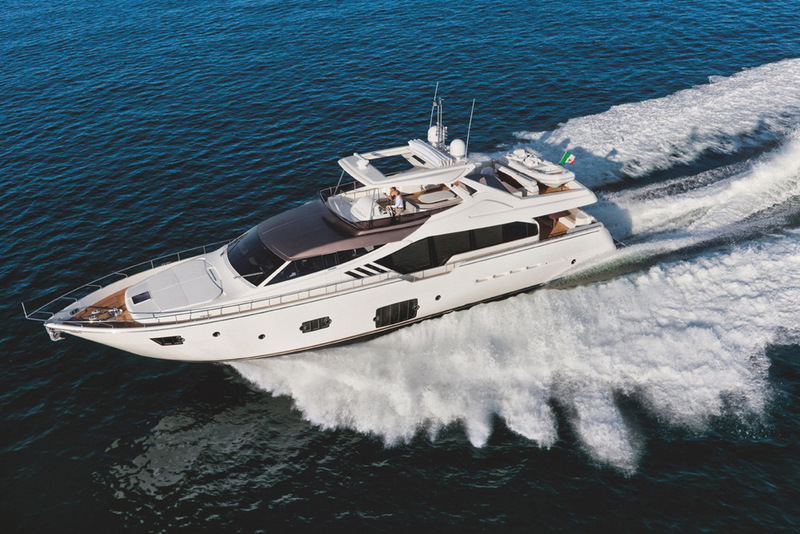 Compare and contrast the Sessa Fly 42 with the yet-to-be-released Bavaria Project DA10 and the Rodman 42 Flybridge: first look video. The lovely looking F42 is the smallest of Sessa's three Fly models.